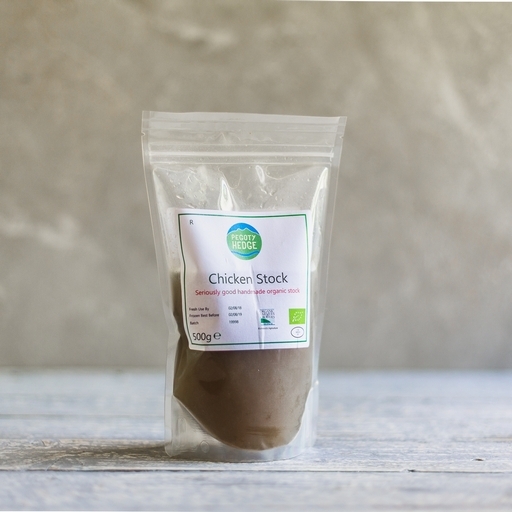 Deeply flavoursome organic chicken stock - a delectable base for soups and stews. Made in the old-fashioned way at Pegoty Hedge farm: organic chicken, herbs and veg, simmered slowly for 24 hours to extract maximum goodness. Add to risottos or mashed potato for a mouth-watering lift. It freezes well, so you can always have this kitchen stalwart at hand. Simply heat in a saucepan to a gentle simmer. Keep in the fridge for up to 7 days or freeze on the day of delivery. Located in the picturesque Worcestershire countryside at the foot of the historic Malvern Hills, Pegoty Hedge is a family-owned and run business located on an organic mixed farm. Their ethos is simple: if you use quality ingredients in the beginning and pay care and attention in cooking you will produce a consistently great tasting product. As well as running a busy farm, the owners also run a campsite situated near to the town of Upton on Severn; ideal for summer weekend breaks! Water*, chicken bones (30%), onion, carrots, celery, garlic, tomato purée, sunflower oil, black pepper, thyme, bay leaves.